The sunflower or Helianthus annuus is an annual flower which is famous for its extremely large and vividly yellow blooms. Sunflowers are native to South America, but they are widely cultivated all over the world today as ornamentals, food plants, and for their valuable oil. Many people enjoy growing sunflowers, because they are quite easy to grow and they are a great way to brighten even a small garden. It is estimated that the sunflower was domesticated around 1500 BC in South America, presumably for the purpose of utilizing the oil-rich and highly nutritious seeds. Sunflowers were also used as a source of dye. When European explorers were introduced to the sunflower, they brought it back with them, with sunflower cultivation in Europe dating to around the 1600s. France in particular has become famous for its sunflowers, perhaps because of Van Gogh's lush paintings of sunflower fields in bloom. A domesticated sunflower can grow over six feet (two meters) in height, producing one or many composite blooms known as heads on a coarse stem with rough, hairy leaves. The "flower" of a sunflower is actually composed of hundreds of tiny florets packed together. When the head is fertilized, the florets on the side of the head develop into seeds, while the petals along the sides wither and fall off. In addition to classic yellow, these petals can be orange or maroon in color, and the seeds may develop in white, black, or striped forms. Sunflower seeds are rich in protein, oil, and several nutrients. As a result, they are a popular snack in many regions of the world, especially when roasted. They can also be pressed to extract the oil, which may be used in cooking and in various industries. Sunflower oil is famously nutty in flavor, and very good for the skin. The most well known trait of the sunflower is probably its heliotropism. Sunflowers actually follow the sun, with heads which face east in the morning, and slowly track the sun across the sky. After dark, the heads reorient themselves to face the east for morning. This trait is more pronounced in domesticated sunflowers, incidentally. Growing sunflowers is easy, and in fact the flowers can turn into weeds if allowed to grow unchecked. They thrive in USDA zones three through 10, with most garden stores carrying an assortment of varieties, for people who want to grow sunflowers in exotic colors like maroon and white. "Helianthus," is the scientific name of the sunflower genus. It is a combination of two words "Helios," meaning sun and "Anthos," meaning flower. The sunflower plant can grow from 3 to 18 feet tall. A sunflower only requires 90 to 100 days to grow. Growing sunflowers is a great way to attract birds to your yard. More than sixty different varieties of sunflowers can be found in the world. Out of all these, the most common one is bright yellow, with dark brown centers filled with seeds. A sunflower head is made up of 1,000 to 2,000 individual flowers that are joined together to a base. The large petals that are found around the edge of a sunflower are individual ray flowers, these do not develop into seeds. A domesticated sunflower has a single-stem and a large seed head. This is in contrast to the wild variety that is highly branched with small heads and seeds. A distinguishing quality of the sunflower is that its flowering head tracks the sun's movement. This occurrence is known as "heliotropism." 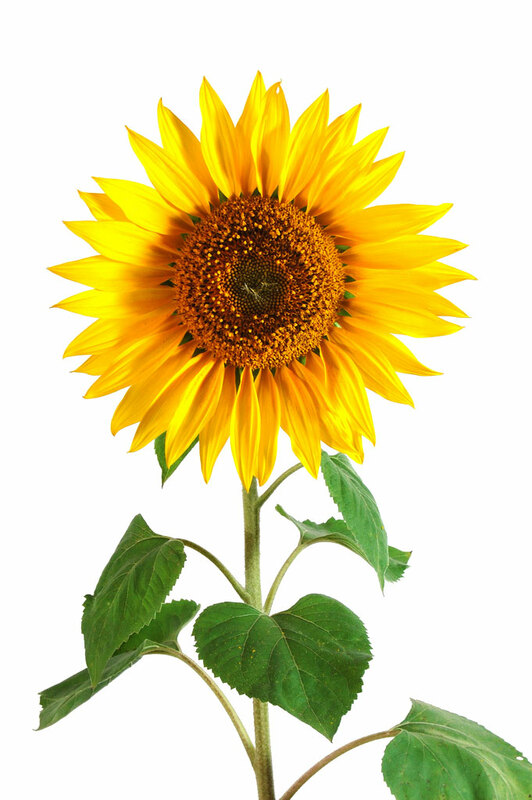 Sunflower seeds are used to produce numerous things like cooking oil, medicine, paint, animal feed and biodiesel. In the last few years, a new form of low-pollen sunflower has been created. This method will not only help reduce the risk of asthma for pollen suffers, but also increase the life of the flower itself. New kinds of sunflowers that range from orange, tan, maroon or striped petals are being created. Not only are they different in color but, their centers are also green and yellow instead of the original sunflower color we all love. The tallest sunflower was grown in the Netherlands by M. Heijmf in 1986 and was 25' 5.5" tall. Kansas city has been nicknamed "The Sunflower State." 32.5", was the size of the largest sunflower head which had been grown in Canada. The Bonsai technique was used to make the shortest mature sunflower record. The sunflower was grown and was just over 2" tall.